With just two weeks to go until Episode Four of STAR TREK CONTINUES enjoys a debut screening at Phoenix COMICON, we’re excited to see your reaction to our fourth full-length episode. We can’t wait to meet our fans, answer questions, sign autographs, and celebrate what so many of you have made possible. Earlier this year, our cast and crew gathered to shoot Episodes IV and V at the same time. We have a strong commitment to proper stewardship of the funds that fans have contributed. It’s far less expensive to shoot two episodes in the same period, saving on travel and hotel costs as well as rentals and other expenses. Later this year, we’re planning to release our fifth episode (which will also be the first episode of STAR TREK CONTINUES to feature many scenes shot on location). Our friends and fans contributed more than $200,000 through the very successful “Kirkstarter 2.0” STAR TREK CONTINUES crowdfunding campaign. We not only reached our “Kirkstarter” goal, we reached a “stretch” goal to Build Scotty an Engine Room! Work began on that massive project a few weeks ago and you’ll find an update in this issue of Subspace Chatter. STAR TREK CONTINUES also now completely owns our shooting sets in south Georgia. We have taken over the remainder of the building that has now been christened as “Stage Nine,” – in honor of Desilu Stage Nine (where the Enterprise sets for the first season took shape nearly 50 years ago). At 18,500 square feet, our facilities are by far the largest of any STAR TREK web series – and nobody has ever built the Engine Room! We salute the team at Farragut Films who did much of the actual construction on the current sets and wish them well as they turn to new Trek endeavors. In addition to a place for Chris Doohan’s “Scotty” to hang out when not on the Bridge, we’re also making several improvements to the standing sets – rounding out the Bridge to make it a full 360-degree set. As my friend and set designer Will Smith frequently says, “we’re making STAR TREK!” And Will has a three-page list of enhancements to the Enterprise sets that are also on the docket. One of the most endearing things about the Original Series was the variety of stories that they told. Continuing in that spirit, our Episode IV will be a much more personal, dramatic story than our previous outing. 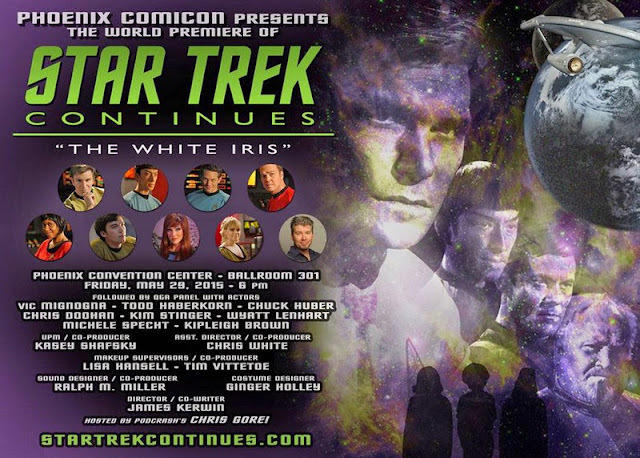 It’s called “The White Iris,” and it features a special guest appearance by Colin Baker (“Dr. Who” from 1984 to 1986). Tune in online starting May 29 to see our next big adventure as STAR TREK CONTINUES. Looking forward to seeing it! I really loved "Fairest of Them All," and I have high hopes for "The White Iris." Thanks for the update! Can't wait! To Vic, the crew, writers and production team -- you guys are brilliant! So excited that the Trek continues! Thank you! Easy for you all to get excited about the STContinues ideas, much harder to follow through - so your success at follow through is impressive and appreciated. ST:TheNextGen was a sensible update to the series and set back in the 1990's. But STContinues is very smart to adhere to ST:TheOriginalSeries as much as is plausible. I remember hearing Vic say that STC was purposely keeping the "bad lighting" of ST:TOS and thought to myself - hmm right on. Congrats on being so good that STC fans consider your episodes to be Star Trek canon. The White Iris is no longer available on YouTube thanks to a copyright claim by CBS? The other episodes are still up. What's going on? Got to see the episode through your Vimeo page. Sincerely, that was one of the best stories about Jim Kirk I've ever seen, and made perfect sense following on from his many adventures. Thank you for sharing that story. Vic, you were amazing! The rest of the cast was great, but I will also add that you really got the relationship between Bones and Kirk right this time. To everyone involved, thank you again very much for all the hard work that you do in making these episodes! The ending was a very emotional experience! Thanks to Vic and all for continuing the five year mission. Thanks to Marina for voicing the computer too! An absolute first rate production. When the five year mission is completed, PLEASE, release these on dvd! They deserve no less! I love that you have addressed the issue of Kirk's loves. He has been utterly and absolutely in love with women he has lost. I've often wondered how a man in his position can possibly deal with those emotions. Despite the help he received from Spock over Rayna, the others must have been devastating. But of course it is just a show, right? Not really, it is an iconic view of humanity itself. As a woman, I've always thought of Kirk as a rogue, or even a cad, but this episode has done for me what it did for Kirk himself. It brought to terms the issue of Kirk's apparent philandering life, and shining a light on his genuine humanity and ability to love deeply and purely. Thanks, Vic, for the redemption. Vic and all. good job, you are wonderful. ST Continues must live forever!!! And to top it off--Colin Baker! Congratulations to the team for another episode in the grand tradition! Ive just discovered Star Trek Continues and i saw all 4 episodes in a row! And i must say, im impressed, really impressed! Keep up the good work guys, you have won a fan right here! Any date for the 5th episode? Following up on my last comment, I have noted the lack of availability of DVD ISO files so we can have our own copies of the episodes. To this end, I have created my own and have used the cover artwork provided by Deviant Art but am still puzzled why nobody has yet provided DVD labels themselves. This is a problem with both our major Star Trek fan made episode creators in that cover artwork is not provided. "Scott to bridge, warp drive standing by." I watched the first three ages ago but have only just watched The White Iris. It's fantastic! I enjoyed the others but this far surpasses them, you guys have really improved.